Sometimes it’s no fun to be an economist. Or, to be more specific, it’s rather frustrating to understand Bastiat’s insight about the “seen” and the “unseen” and to always be asking “at what cost?” and “to what effect?” when politicians make inane statements. But if you’re the type of person who recognizes the importance of tradeoffs and incentives, then it’s easy to see how a political success can be an economic failure. Which is the message of this new video from the Center for Freedom and Prosperity Foundation. This is music to my ears. I’ve been saying for years that any company can be kept afloat indefinitely with taxpayers subsidies. So if that’s the definition of success, we can party until we hit the fiscal brick wall. But that wall won’t feel good, as we can see from the fiscal chaos in Greece and other European welfare states. But this issue involves more than just inefficient subsidies. I’m also concerned about the corruption that inevitably exists when cronyism replaces capitalism. It’s quite likely, after all, that GM is spending lots of money on the Chevy Volt because of pressure from Washington rather than demand from consumers. And when you have a car company executive endorsing higher gas taxes, it’s reasonable to think that he’s currying favor with the political masters in DC rather than looking out for the best interests of drivers. The GM bailout may be a win-win situation for politicians and lobbyists, but it’s a lose-lose proposition for taxpayers and the economy. P.S. If you want some auto bailout humor, here’s a spoof on the Chevy Volt, an advertisement for the new GM Obummer, a couple of good political cartoons, and a very funny video on the Pelosi GTxi SS/RT. While I often complain about government waste and stupidity, I’m not even sure what to say about this grim bit of news from Reuters. General Motors Co sold a record number of Chevrolet Volt sedans in August — but that probably isn’t a good thing for the automaker’s bottom line. Nearly two years after the introduction of the path-breaking plug-in hybrid, GM is still losing as much as $49,000 on each Volt it builds, according to estimates provided to Reuters by industry analysts and manufacturing experts. Cheap Volt lease offers meant to drive more customers to Chevy showrooms this summer may have pushed that loss even higher. There are some Americans paying just $5,050 to drive around for two years in a vehicle that cost as much as $89,000 to produce. …The weak sales are forcing GM to idle the Detroit-Hamtramck assembly plant that makes the Chevrolet Volt for four weeks from September 17, according to plant suppliers and union sources. It is the second time GM has had to call a Volt production halt this year. GM acknowledges the Volt continues to lose money, and suggests it might not reach break even until the next-generation model is launched in about three years. Gee, it’s almost as if everything that critics have said all along is right. But not to worry, taxpayers are underwriting the costs. So if bigger subsidies are the price of buying support from the UAW and allowing fat-cat incompetent managers to stay on the job, that just means a bigger tab to pay for the rest of us. P.S. If you’re a taxpayer and need to be cheered up, these cartoons may help. P.P.S. This spoof video on the Volt may be even funnier. P.P.P.S. Last but not least, Government Motors plans to build on the success of the Volt with the Obummer. It was due in 2011, but standard government incompetence has pushed back the release date. 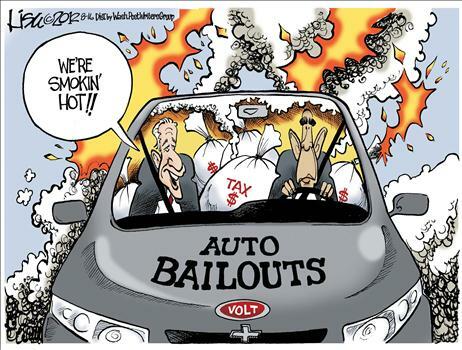 I’ve been against the auto bailout from the very beginning because it was a corrupt payoff to lazy corporate fat-cats and an ossified union. And when folks on the left say the bailout is a success, I explain that any industry can be propped up with a sufficiently large injection of other people’s money. Now we have new data on how much “other people’s money” has been diverted. It’s a big number, and it seems to get bigger each time there’s a new estimate. Here’s part of a Reuters report. 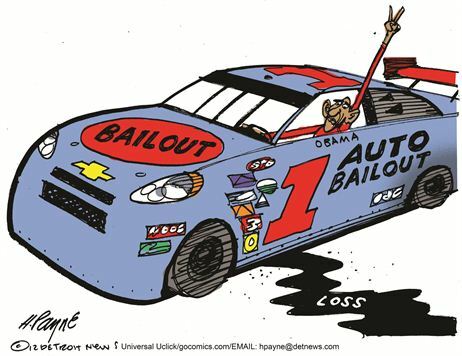 The U.S. Treasury Department has said the auto industry bailout will cost taxpayers $3.4 billion more than previously thought. Treasury now estimates the 2009 bailout will eventually cost the government $25.1 billion, according to a report sent to Congress on Friday. That is up from the last quarterly estimate of $21.7 billion. Sort of reminds me of the old joke about the lousy businessman who says he loses money on every sale, but he makes up for it with high volume. Well, that incompetent businessman has a kindred spirit in the White House. Here’s some of what Politico reported. Well, we can’t say we haven’t been warned. He wants to do the same thing in “every industry.” Well, according to the Bureau of Economic Analysis, there are 60 industries in America. At $25 billion each, that means $1.5 trillion. By the way, Mickey Kaus explains that the government’s numbers are incomplete and that the actual damage is significantly higher. And this Reason TV video exposes some of the government’s chicanery. P.S. If you’re in the mood for some satire, here’s a bailout form showing how you can become a deadbeat and mooch off the government. P.P.S. Just in case you’re new to this blog and don’t know my history, rest assured that I’m also against Wall Street bailouts. P.P.P.S. Ethical people should boycott GM and Chrysler, particularly since these companies are now handmaidens of big government. This might not be quite as funny as the Iowahawk video on the Pelosi GTxi SS/RT, but it’s a close call. In any event, this is extremely clever, makes an important philosophical point, and deserves to be shared widely. 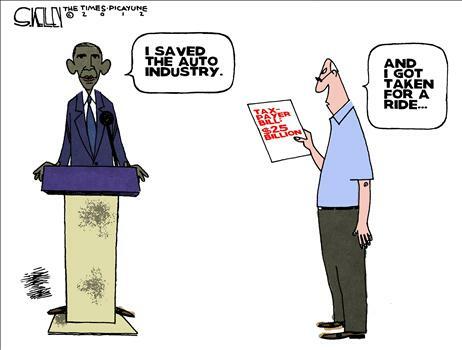 And since we’re on the topic of mooching car companies, here’s another very good parody, featuring the sleek new Obummer from Government Motors.